Here’s a festive Christmas tablescape featuring a winter village houses with snowy scene and a beautiful miniature Christmas tree. 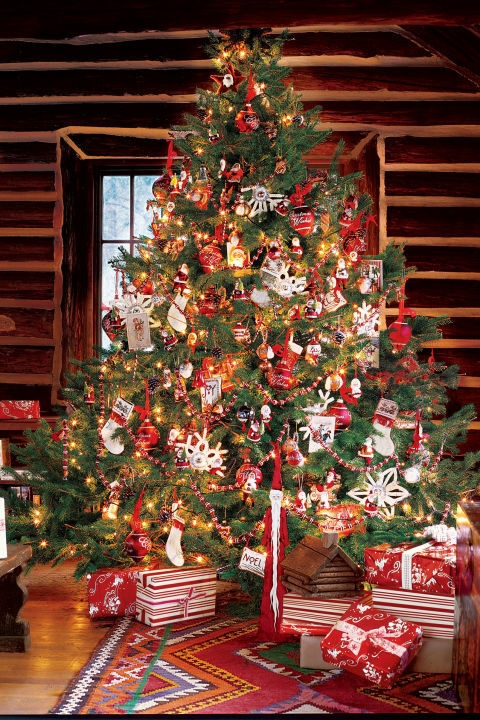 The tree is decorated with pinecones and bright colored red Christmas balls which made the whole scene extra wonderful. 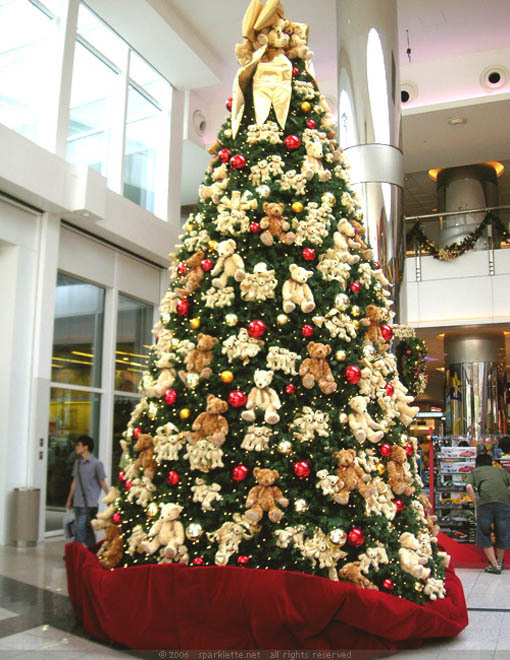 Nowadays, artificial Christmas trees are more common than the natural ones. Most of the trees that you can buy from the market comes with pre-lit feature. No need to add Christmas light strings on them. This Christmas tree is quite festive with its bright red ornaments that goes along well with white decorations (snowflakes and stockings). 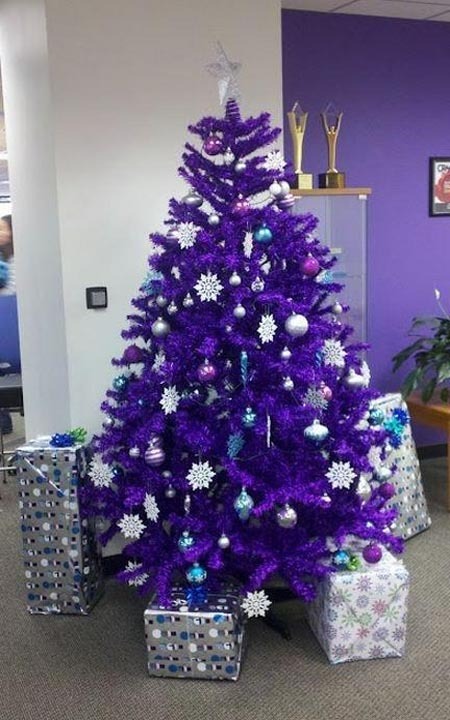 This is such a very lovely and beautiful Christmas tree. Decorated with Christmas balls with different colors and vibrant Christmas light, this surely will be a center of attraction in any living room. It’s that time of the year again! It’s about time to set up your Christmas tree. Yes, Christmas tree is probably one of the most apparent signs that you’re ready for Christmas. It’s time to hang those ornaments and tinsels and light it up with those colorful bulbs. 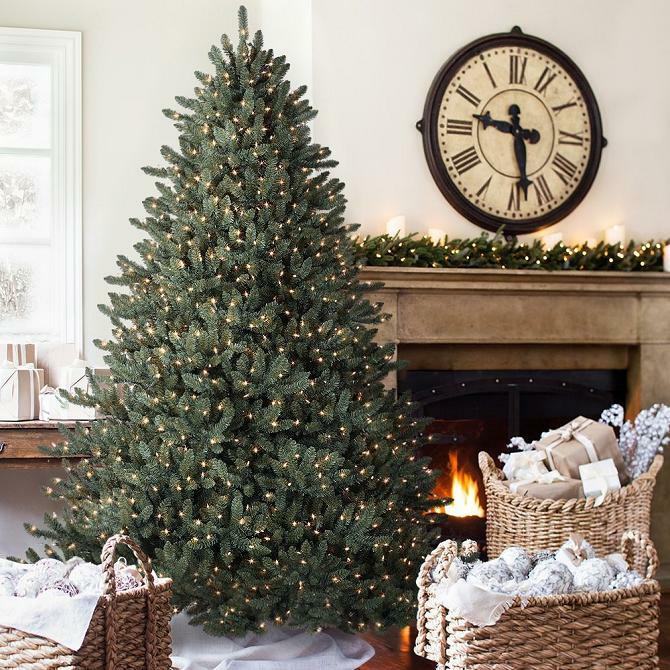 Because of the season’s immense popularity, there are literally thousands and thousands of Christmas tree decoration ideas that you can incorporate to make your home a more magical place this Yuletide. Christmas is a time for joy and laughter. It’s a holiday meant for people to be thankful for their blessings and to spread some holiday cheer wherever they go. 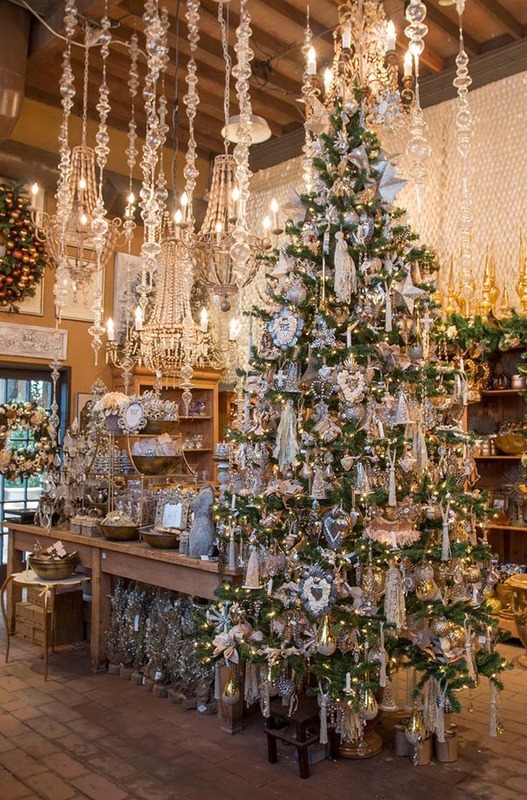 Christmastime is also a chance for your home to shine… literally! 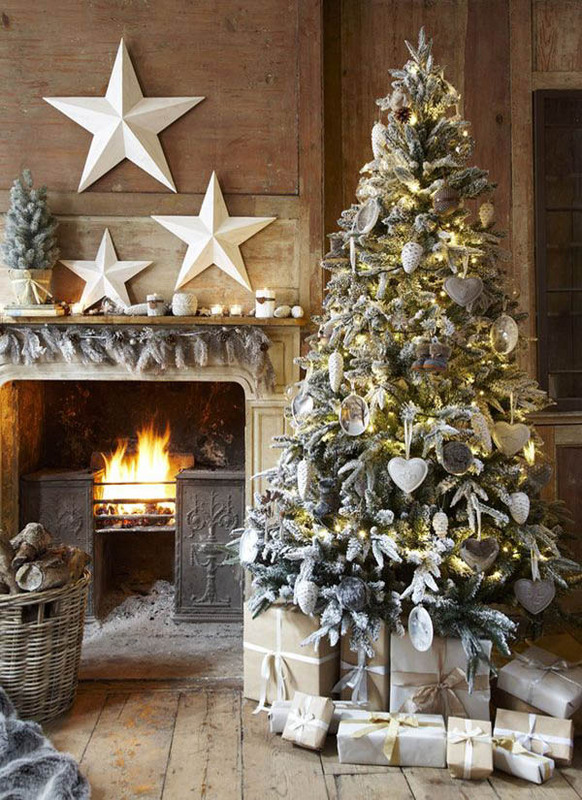 Show off your Christmas spirit this year by getting inspired by these Christmas tree decoration ideas that will definitely earn you some good points in Santa’s list. So, what are you waiting for? Set up your own Christmas tree and make it welcoming for Christmas is coming. 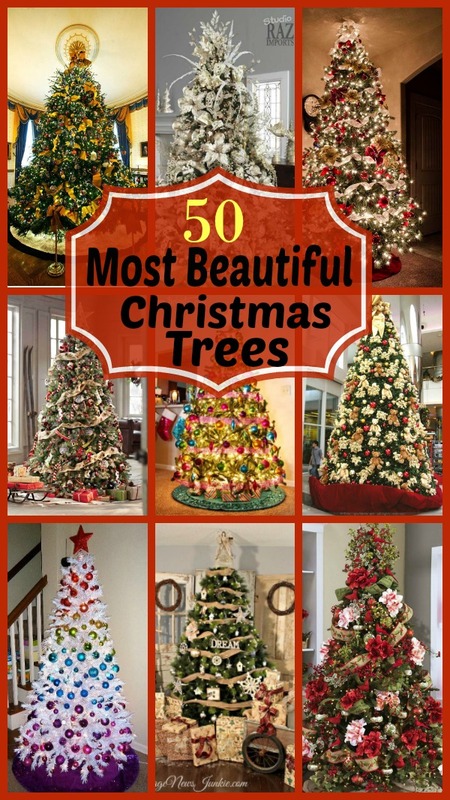 Let’s spice up the holiday and get into the spirit of the season with these different Christmas tree ideas we have that will surely make your home merely ready. 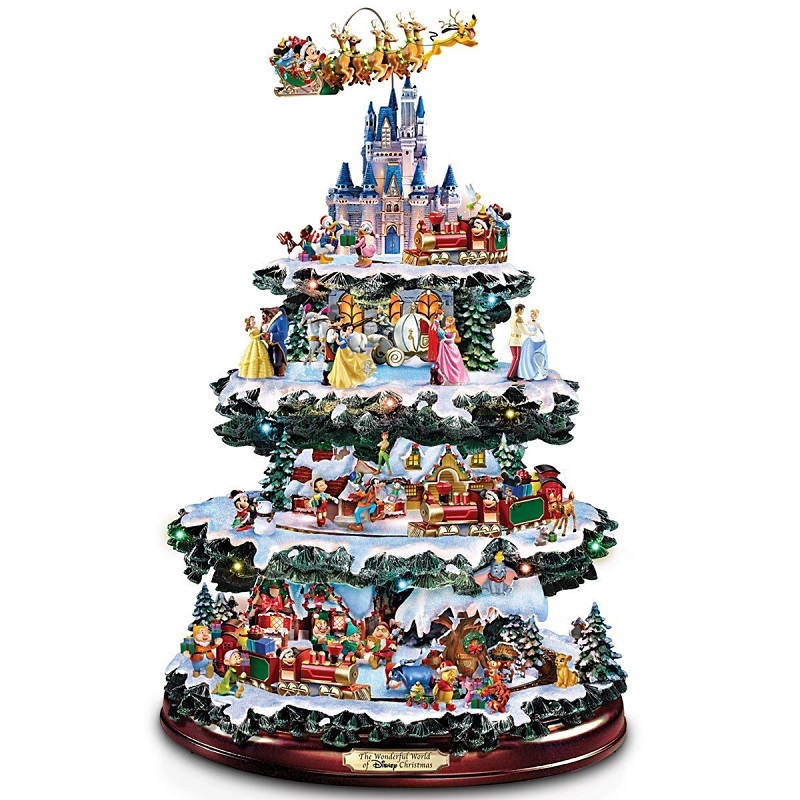 This is, no doubt, one of the most elegant Christmas trees that I’ve seen as I browse. This one features extravagant ribbons and baubles, from gold to red. While the first tree boasts its gold elegance, this one has its striking elegance with its silver ornaments and decorations. 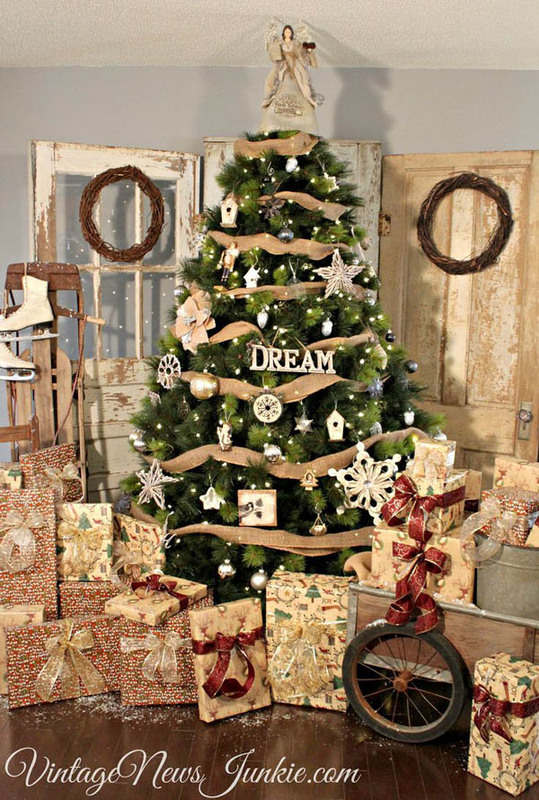 For those who want Christmas trees with mellow, calming colors, you may opt for rustic themed Christmas tree. Instead of mesh ribbons, you can use burlap. 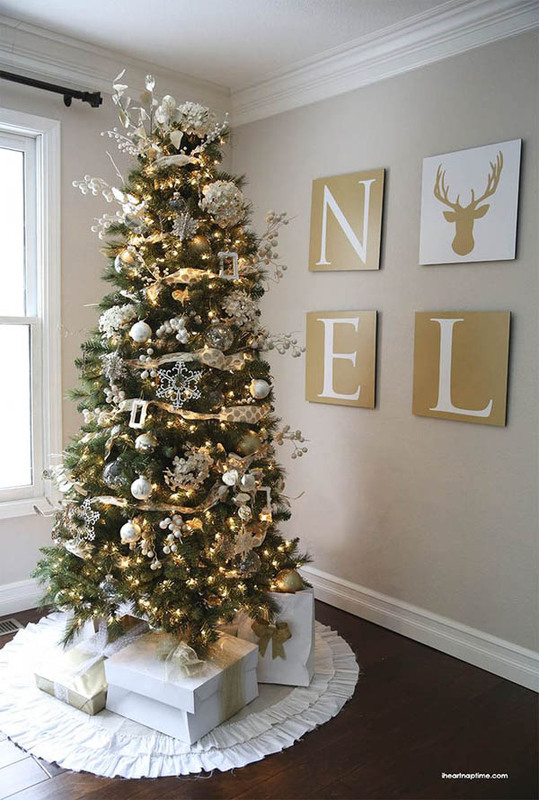 Opt for gold and white ornaments too. 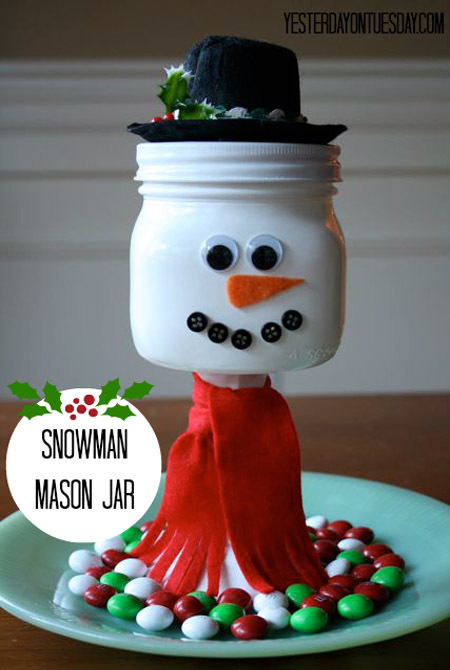 Here’s another rustic Christmas tree decoration idea that you may want to pull off this holiday. 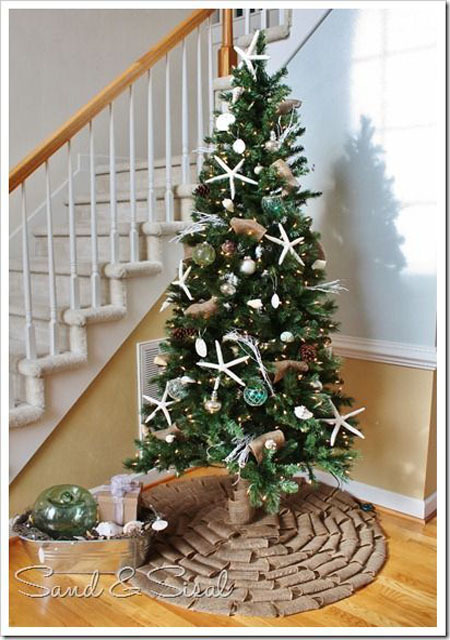 The wooden ornaments and pinecones goes along well with the tree. 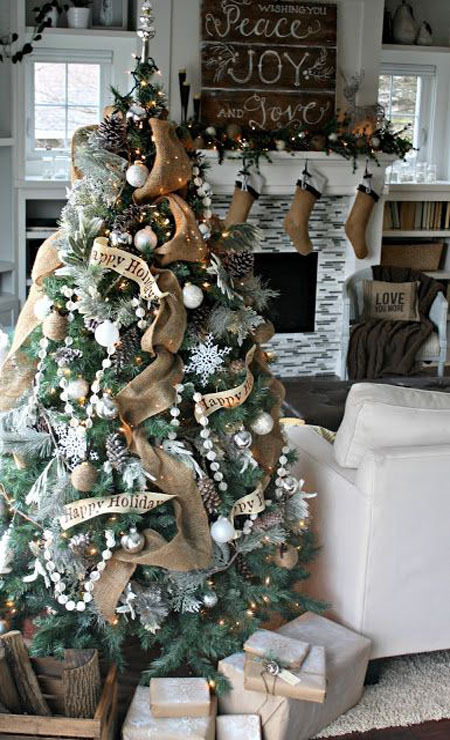 The brown ribbon wrapped around the tree with the greetings on it made the tree stunningly gorgeous. What a gorgeous way to decorate a Christmas tree. 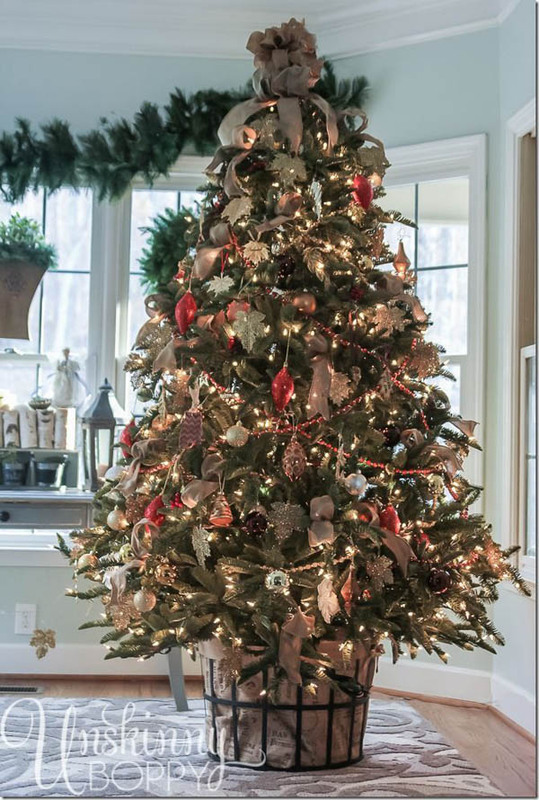 Decorated with mesh ribbons, flocked pinecones, ornaments and artificial peppermint decor, this Christmas tree is truly one of the most beautiful trees I’ve ever seen. Simplicity is beauty and this is quite true when you look at this Christmas tree. 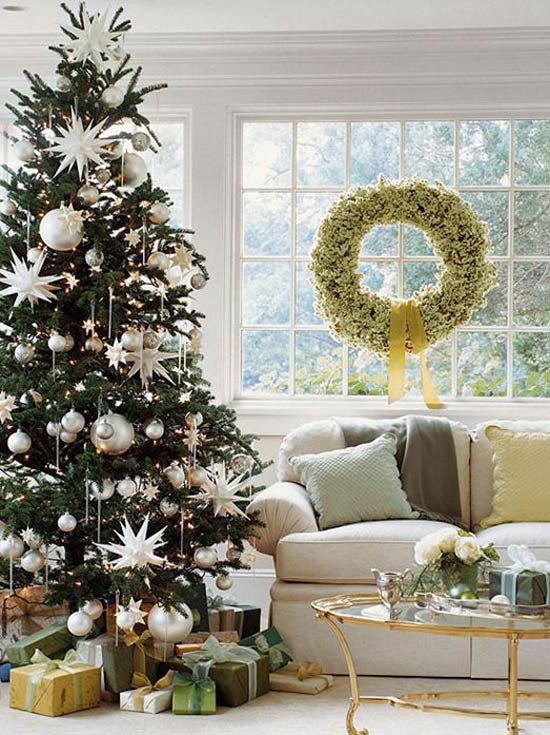 Simply decorated with white garland and a few white ornaments, this can totally rock your living room. This looks like an eye-candy… figuratively! Having all these colorful candy-looking ornaments. This one is truly a sight to behold. I totally love the combination of red and gold poinsettia, Christmas balls and ornaments. The deco mesh ribbon add elegance to it. How I love this tree! It’s an artificial white tree adorned with layers of Christmas baubles with different colors creating this kaleidoscopic theme. Clever! This is the other version of a rainbow tree. But this time, green Christmas tree was used, but the colors of the Christmas balls still stand out. Love it! 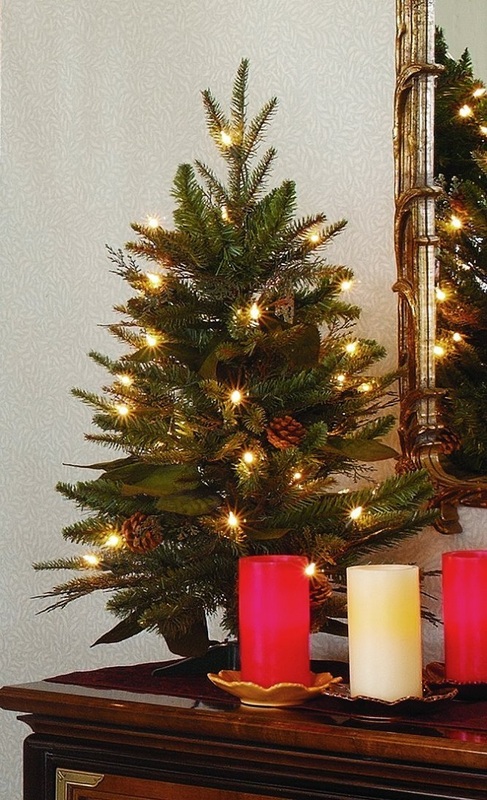 You can use artificial flowers and berries when decorating your Christmas tree. 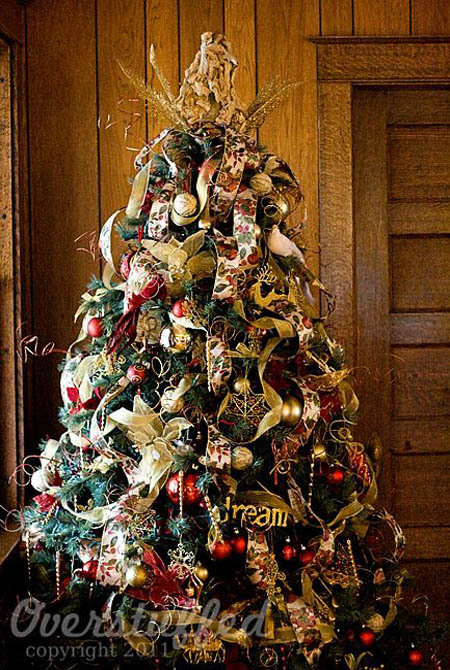 Add some deco ribbons to it and you have this beautiful tree. 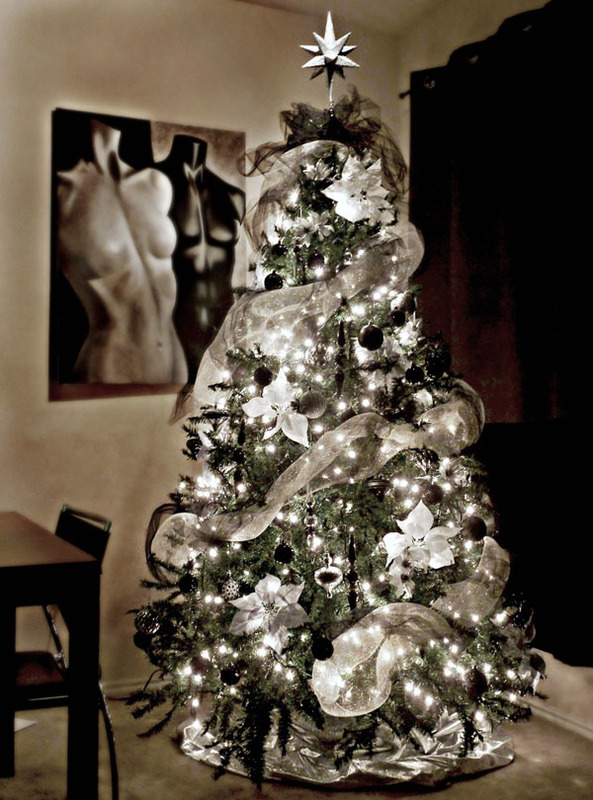 I would totally love to have a Christmas tree like this in my home. Who wouldn’t love a tree with lots and lots of huggable teddys on them. Keep it simple and traditional by adding Christmas lights, a few gold and red Christmas balls, red poinsettia and gold ribbons. And of course, no traditional christmas tree is complete without a star topper on it. But if you want to try something new and bolder, you can use solid theme like this one. Just a bunch of mono-colored Christmas balls and a few elegant strings on them. 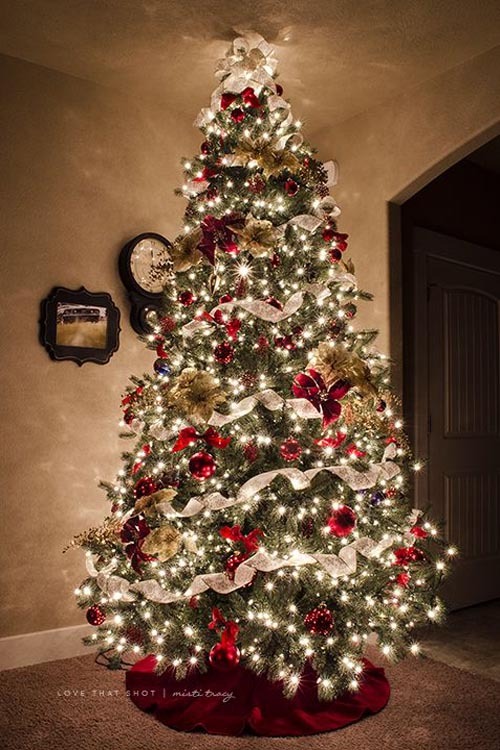 Enjoy the holiday season with your family and loved ones as you hang out in this beautiful, tall and elegant Christmas tree. 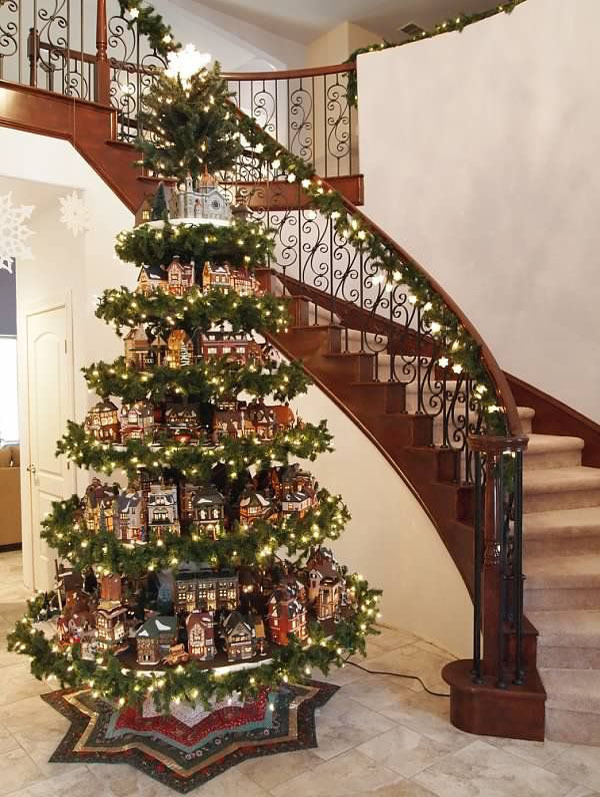 This is one of the most glorious rustic Christmas trees I’ve ever seen. I fell in love with those tiny white garland wrapped around it and the burlap ribbon. 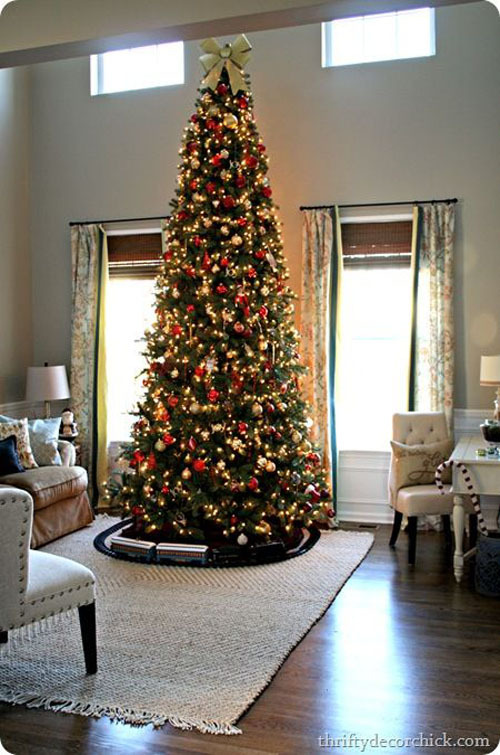 I didn’t know that dull looking burlap can make a Christmas tree as breathtaking as this. This one is pretty clever, unique and creative. I love how the houses served as the “ornament” to decorate the tree. 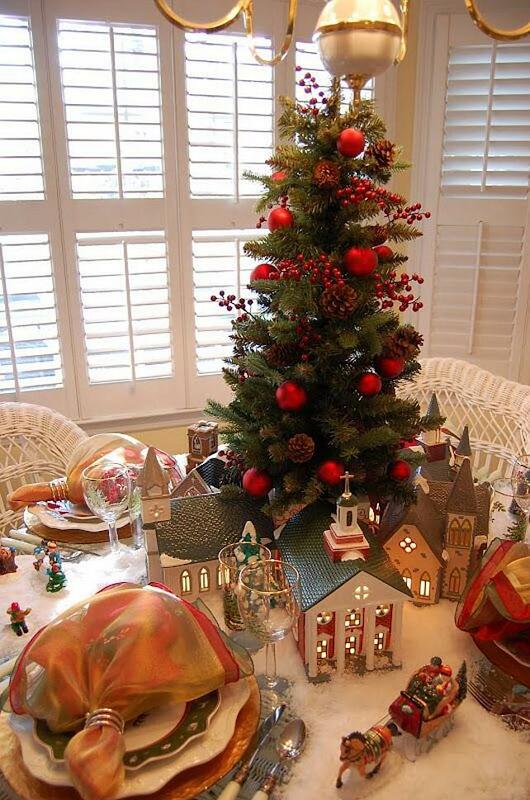 This is a Christmas village and a tree rolled into one. 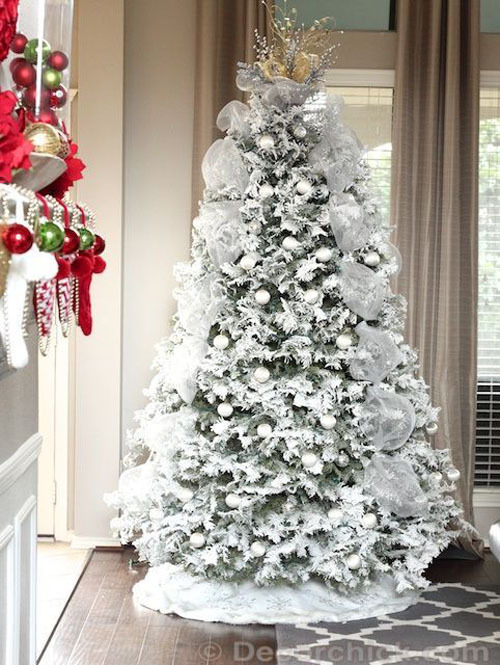 Feel the winter holiday with this gorgeous flocked Christmas tree. This makes me want to experience celebrating the Christmas eve in a cottage with a fireplace. Quite cozy and homey. Go grand and bold. 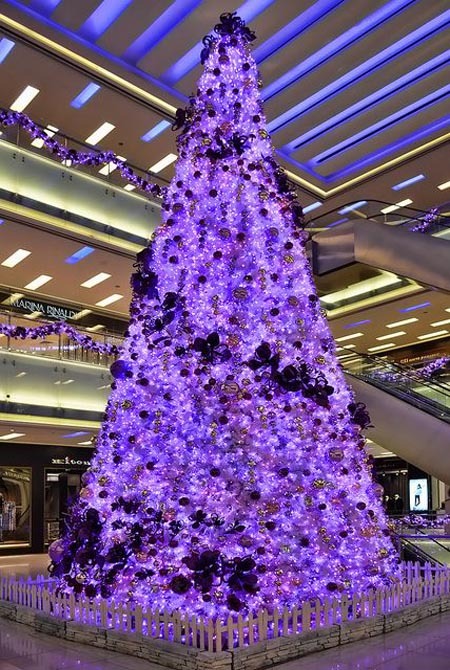 This Christmas tree speaks of boldness with its unique purple and gold ornaments, which made this look grand. 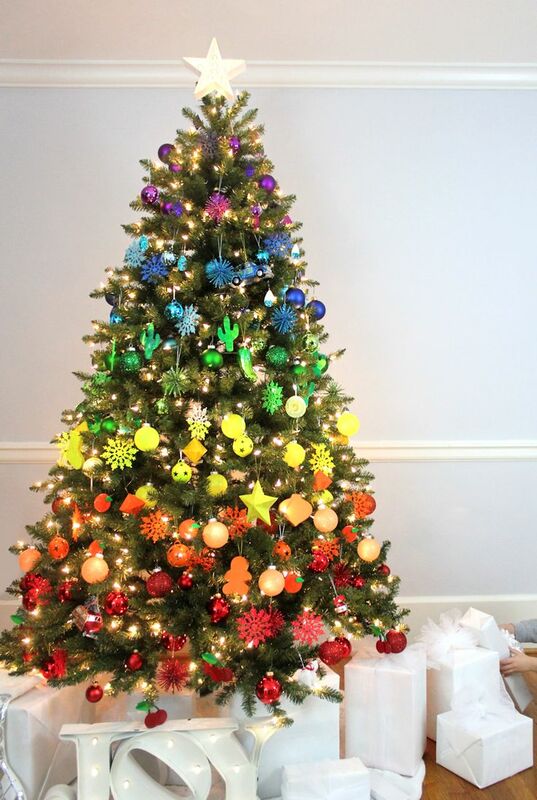 This is a perfect Christmas tree for those who want to a bright and colorful corner in their living room. 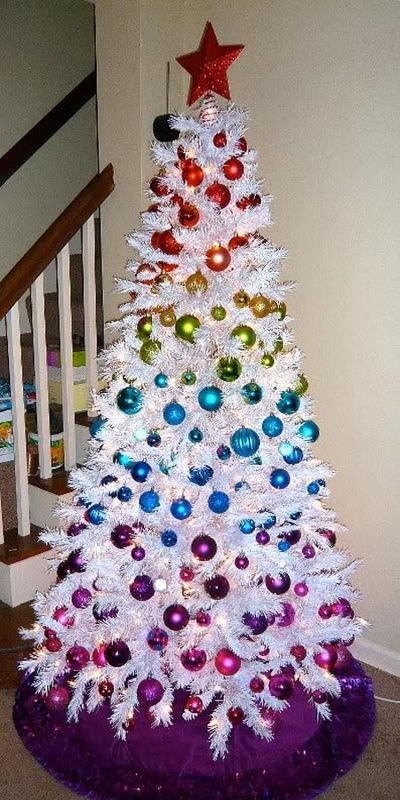 Use Christmas balls of different colors. Then, wrap a ribbon around it. Don’t forget to arrange your wrapped gifts under it. 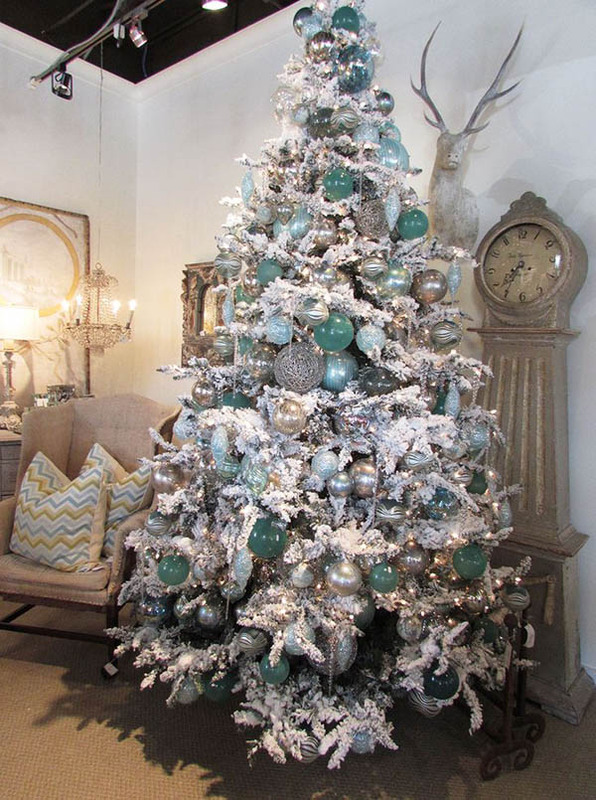 Teal is a gorgeous color for a Christmas tree especially when partnered with silver and sparkling lights. This tree looks very elegant with its teal christmas balls and white deco mesh ribbon. Teal can also go along well with flocked christmas trees. 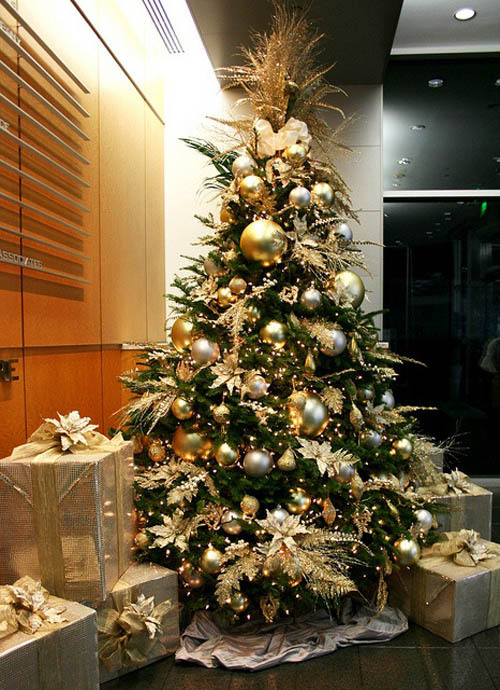 Make your christmas tree elegant and stunning by using silver, gold and white decorations. 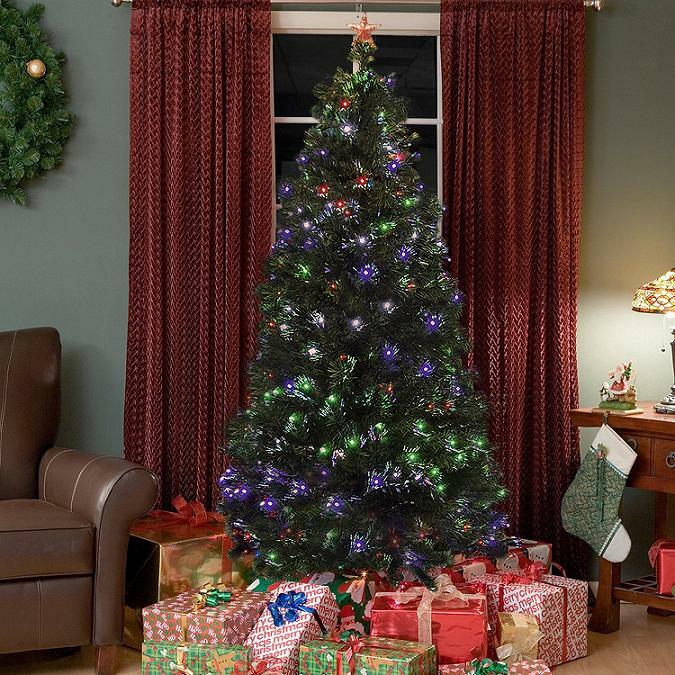 While most christmas trees have lights on them, you may opt to have one that doesn’t have any. 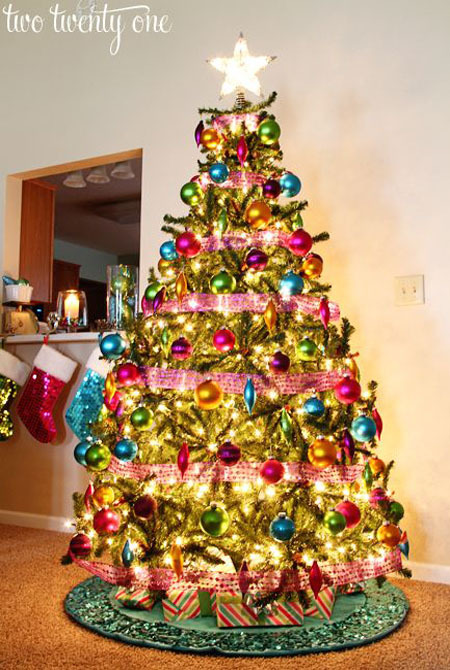 You can still make it stand out by using vibrant and bright colored decorations and ornaments. 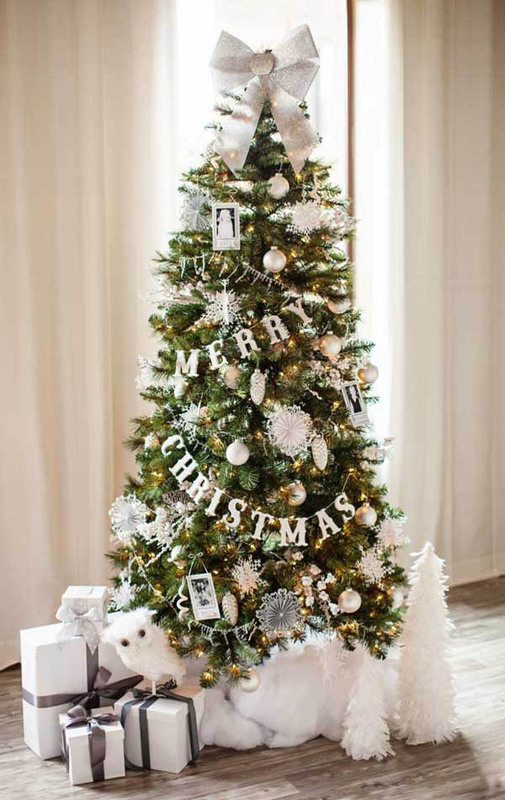 A Christmas tree decorated with white pompom garland, silver ornaments and burlap ribbon. What made this tree unique and extra special is that it displays family photos. 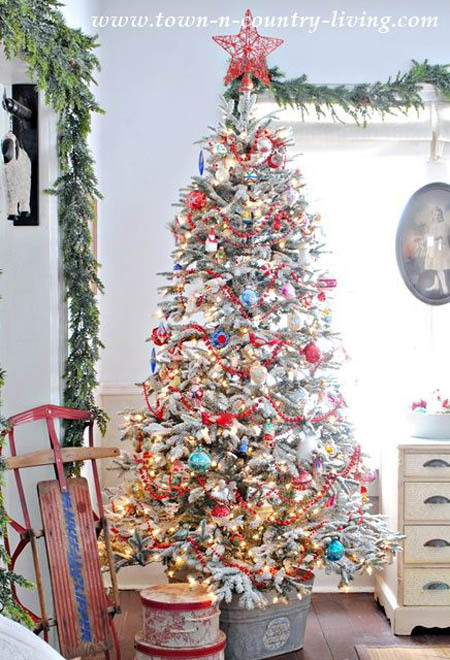 Here’s a creative way to decorate a Christmas tree with deco ribbons. 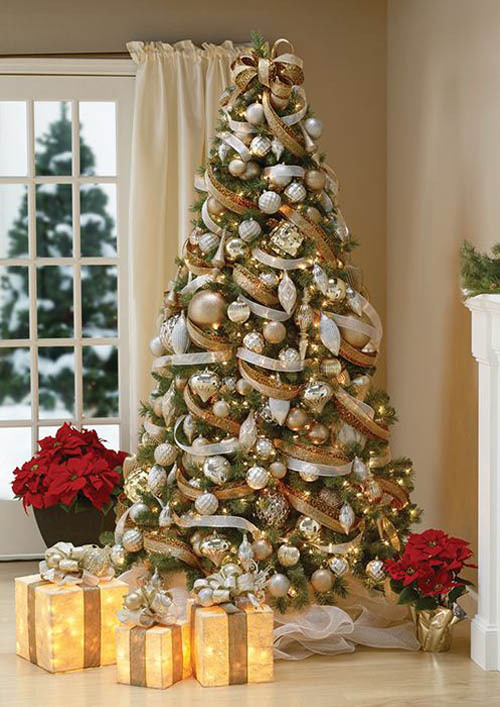 Gold, white and brown ribbons are tied together and wrap the Christmas tree. 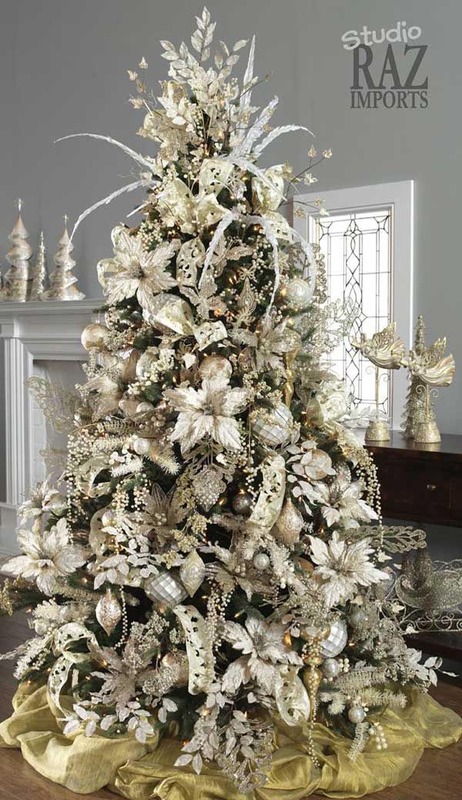 the gold and silver ornaments beautify the tree even more. 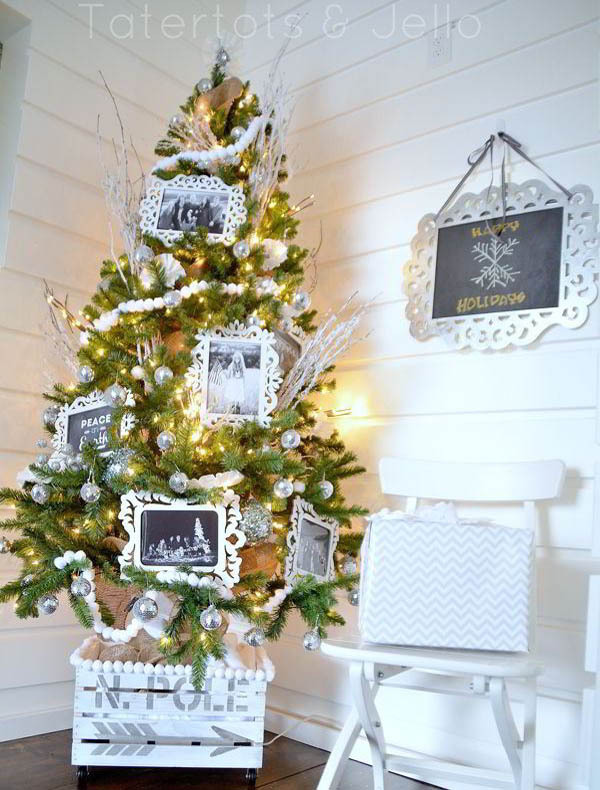 Flocked christmas trees create the ambiance of snowy and winter wonderland which made it most popular nowadays. It’s easy to decorate them too. Just a few gold and silver Christmas baubles will do the trick. Yet another must-have ornament on your Christmas tree. 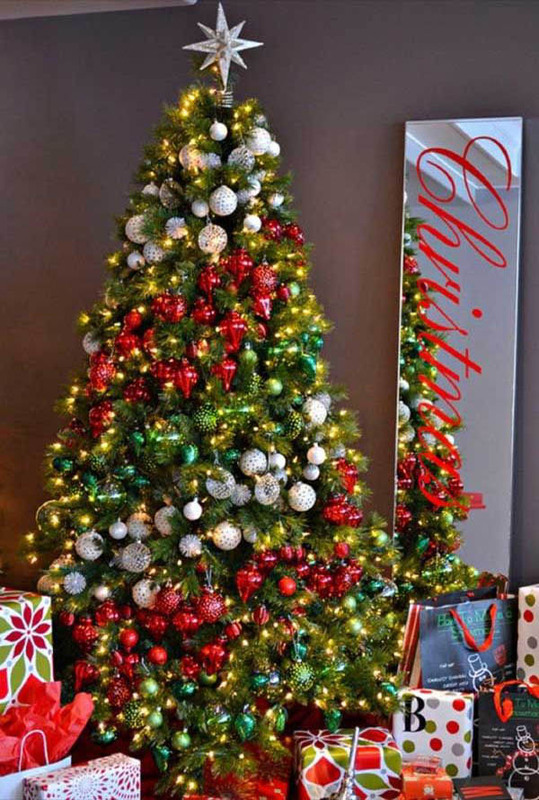 Tinsel garlands can give your tree a special kind of sparkle. Just drape the garland properly and you’ll have a tree to be proud of. 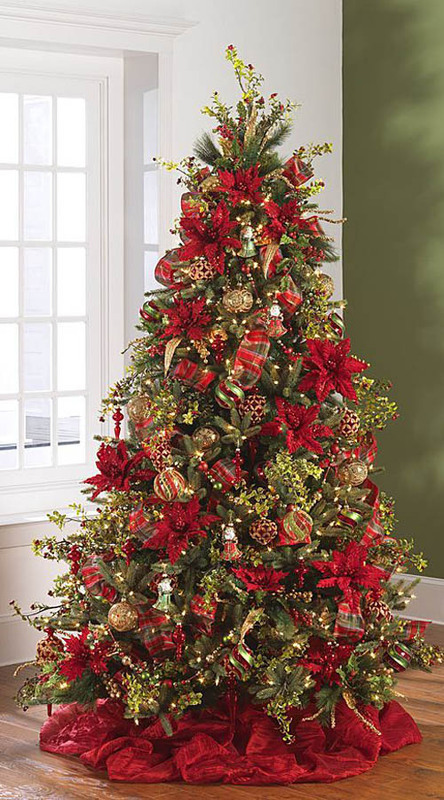 A gorgeous Christmas tree featuring red poinsettia, colorful Christmas baubles, plaid ribbons and beautiful ornaments. The red deco fabric made a beautiful skirt for this tree. 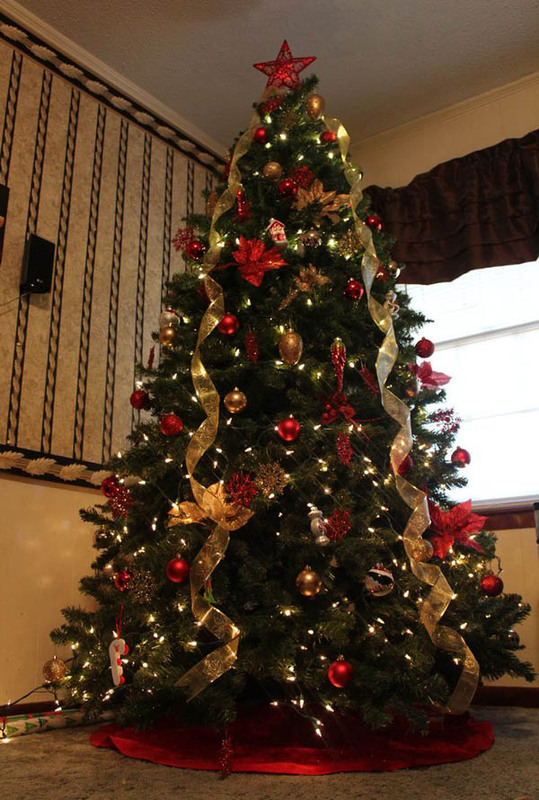 Here’s another dreamy christmas tree decorated with gold christmas balls and brown cheetah patterns ribbons. I love the white stars that add beauty on it. 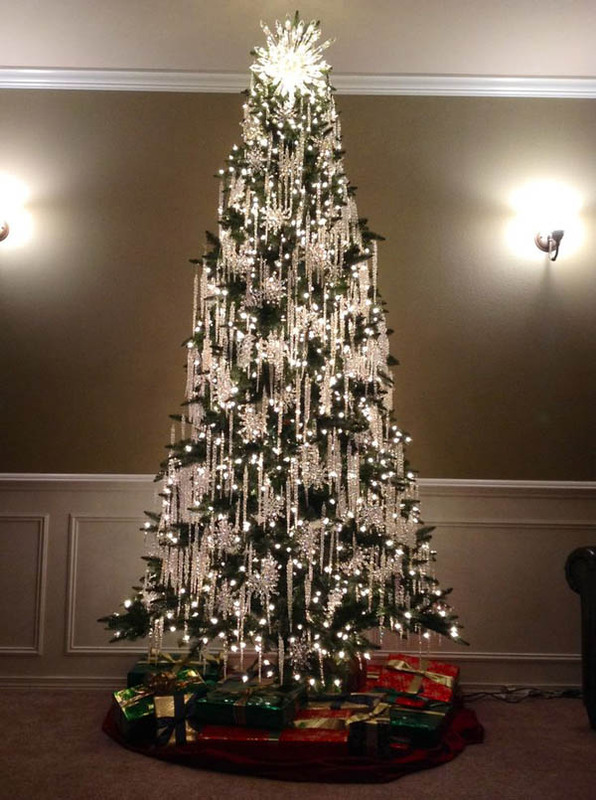 White decorations stand out in this green christmas tree. 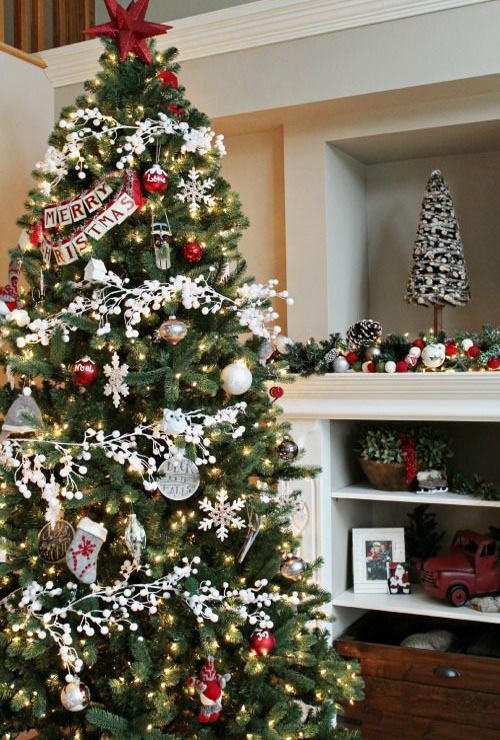 Instead of using the traditional red poinsettia flowers, the white version made this tree unique. 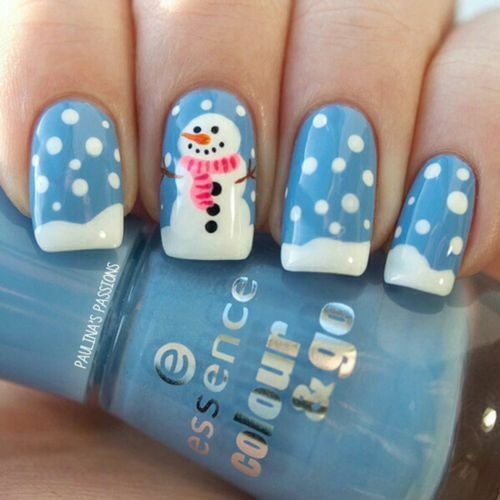 the white bird figures and snowflakes add beauty to it. 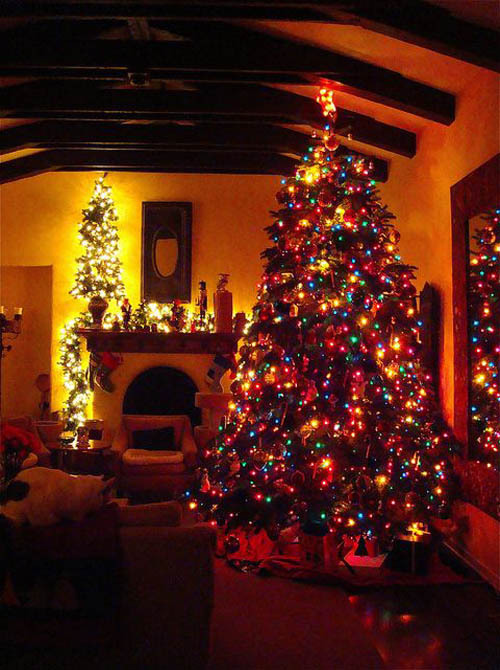 Different colored lights gives your tree a cozy and Christmas-y appeal. You can choose to have simple multicolored lights or alternating multicolored lights. Either way, your Christmas tree will look very charming. Elegance is very prominent in this one. 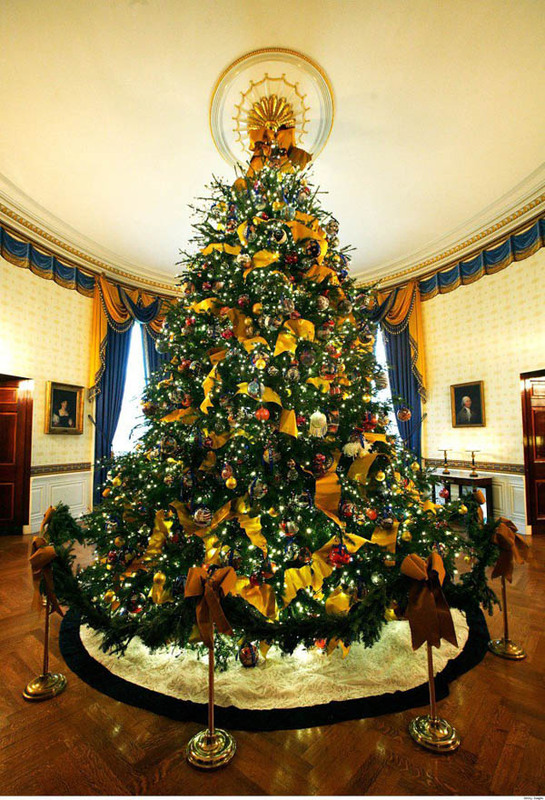 The gold Christmas balls, poinsettia flowers and ornaments made this stunningly beautiful. 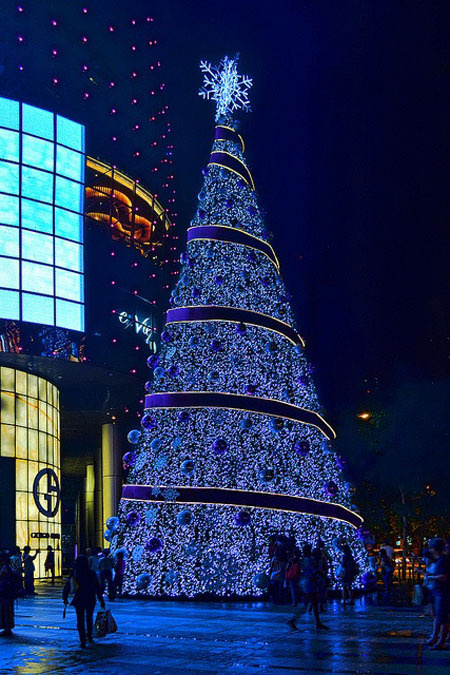 A magical, giant Christmas tree for the outdoor. Wrapped with a giant blue ribbon and decorated with giant blue Christmas balls. 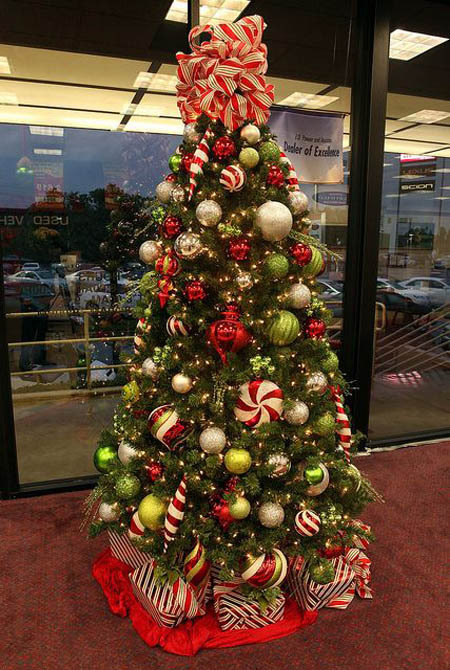 A festive and colorful Christmas tree featuring red, white, and green decorations. Oh my, this is simply beautiful! Not just because it’s bright but it looks so dreamy and you can definitely feel the yuletide season with this. This is one of the best ways to decorate a flocked Christmas tree. Colorful red ad blue ornaments stand out against the snowy leaves of the artificial christmas tree. To make it look rustic, the designer put it in a tin pail. 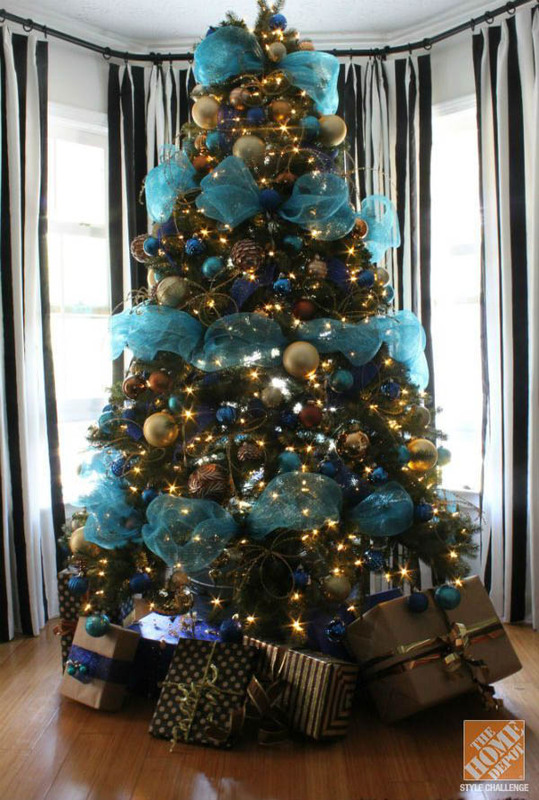 This christmas tree features Turquoise, Blue and Bronze ornaments and deco mesh ribbons. 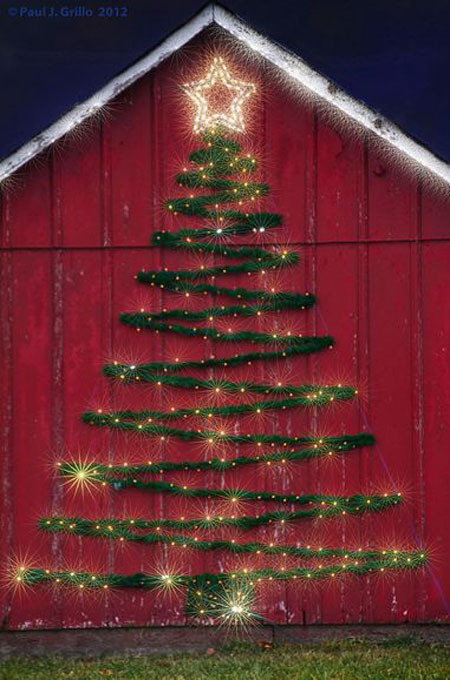 This unique Christmas tree is perfect for outdoor. 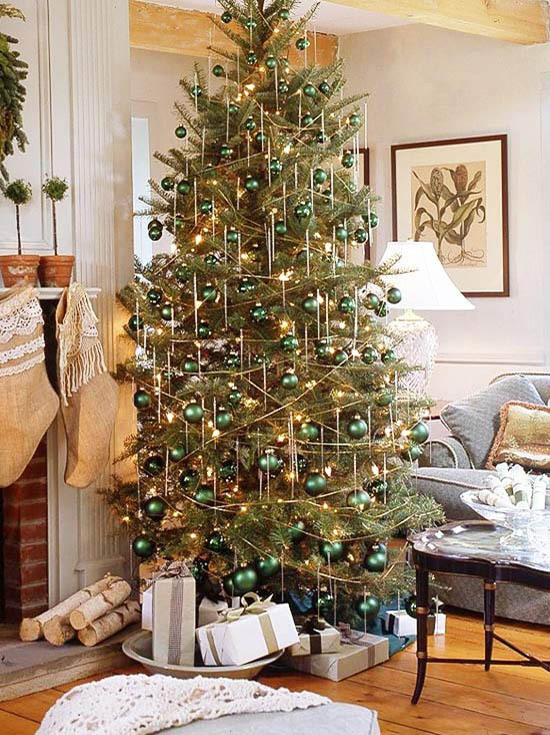 You can simply outline a tree shape using a green garland. Then, add christmas light on it, tracing the outline of the tree. Complete it with a star on the top.